The Samsung Gear Fit has been launched at MWC 2014 in Barcelona with, yep you guessed it, fitness at its heart. It's geared towards those who want a wearable band to track their activites while also getting notifications from their mobile, without the bulk of the Gear 2 or Gear 2 Neo smartwatches. There's a curved 1.84-inch Super AMOLED display - the first of its kind to make it into a wearable device - and on the other side of the Gear Fit there's a heart rate monitor which sits against your wrist. Features of the Gear Fit include a pedometer, exercise monitor, heart rate, sleep, stopwatch, timer and of course a clock. The Gear Fit measures 23.4 x 57.4 x 11.95 mm, weights 27g and comes with a 210mAh battery stuffed inside. Samsung claims this battery is good for three to four days of usage, while it may stretch to five if you're having a lazy week. It's also IP67 certified, making the Gear Fit dust and waterproof, and if you're not a fan of the strap you can change it for a different colour. 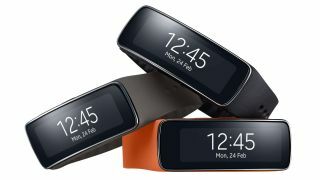 The Gear Fit will be compatible with 20 Samsung devices, the company revealed during its MWC press conference.